I’m in denial that the weather forecast here in Austin says 100 degree temps and am still focusing on fall fashion. Sure, I’m still wearing shorts and skirts and taking trips to the pool while we can, but my brain is definitely fall focused. One trend I have noticed and you’ll see both in the home and on the racks in department stores are metallic accessories. I am so excited about this! Metallic adds a bit of glam that can just make you feel amazing. You can add a hint when you’re headed to your kids sports game or you can add a lot when the hubby takes you on a date. It’s completely up to you how glam you want to feel. 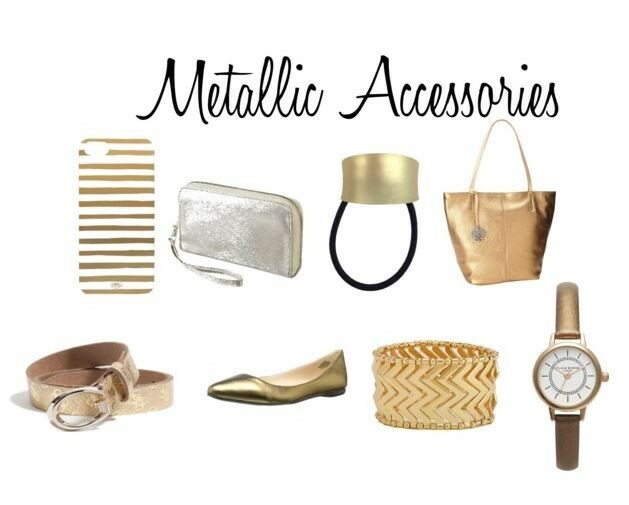 Check out a few metallic accessories. Aren’t those gorgeous? So, what would you wear metallic accessories with? They look great with black, orange, white, pink – oh why don’t I just show you. Jennifer Aniston wears metallic accessories with bright orange and it looks phenomenal. This girl is wearing metallic accessories with white and it works. She’s mixing all kinds of colors with metallic accessories and again…it works. What do you think? Will you jump on this trend and go metallic? Do you already have some stashed away some where? Have you already been wearing metallic season after season? I’ve always leaned towards silver (besides my wedding ring) so I’ll be stepping out of my norm and adding a little more glam this fall.